An abridged version of this tutorial was originally published in the ETE Express, No. 112, 4th Quarter, 2006. Card, defined here as heavier weight paper and various cardboards, has a long tradition in modeling in Germany and Eastern Europe, especially Poland. While plastic kits and scratchbuilding supplies are dominant, card can hold its own against these and provides some great opportunities for creating unique models. I was first introduced to card models as a child when my father brought back a number of structures made by Schreiber-Modellbogen including castles and aircraft. Schreiber is one of the oldest manufacturers of card models and their kits are provided as printed “artwork”. There are many other manufacturers of these kits as well. Links to some are provided in the online version of this article, the URL to which is provided at the end of the article. Over the years I have very much enjoyed building these kits, most of which that found their way onto our layouts. Many years later, after rediscovering the train bug, I very quickly started researching the availability of these kits. I discovered that they were not only very much available, but also that other vendors had become available and new methods of creating kits were introduced. 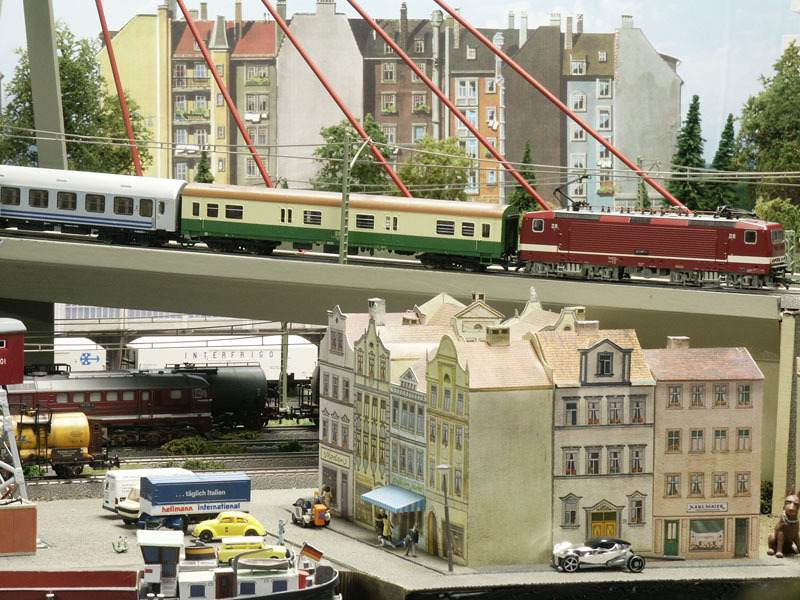 While I have some plastic kits on my layout, the vast majority are card, most from kits by Schreiber and Stipp. However, scratchbuilding has taken over and is a trend that allows me to create unique structures to fit particular situations. I will also confess that my background in bookbinding and conservation have helped tremendously in working with paper and card, with the tools and techniques required for both are highly interchangeable. Some of these kits, primarily Stipp’s (under the Auhagen brand) half-relief background models are available in the US from Euro Train Hobby. The Schreiber models will need to be ordered from Germany through a vendor such as Scheuer & Streuver/Moduni, but as service is excellent this should not be a concern. Links to both are provided at the end of the article. Card kits most commonly make use of traditional “artistic” techniques using patterns and colors to render an object on flat paper. Schreiber and most others use this technique. While the results of this process can look quite attractive, they can also come across as toy-like. Stipp pioneered the use of “photo realism” by which photographs of actual structures are used to create card models taking them to another level. The photo realistic reproductions give the image a great deal of visual detail and depth, something lacking in the “artistic” card models. The image above shows models by Schreiber (including the barge) on the left and Stipp on the right. Assembled as printed all of these kits can look very attractive, especially in the background, but would benefit from additional detailing to work better in the foreground. That said, I enjoy using them in the foreground for sentimental reasons. Thanks to the working properties of card, this detailing can be easily accomplished giving results that can rival plastic. Something to keep in mind is that even though the surface of card is smooth, many of the details such as brickwork as rendered in plastic are very exaggerated when one considers that a depth of 0.1mm on an H0 model corresponds to roughly a centimeter – rather worn brickwork. This difference is even starker in smaller scales. By developing proficiency in some basic techniques will lead to a much higher degree of 3-dimensionality and eventually to scratchbuilding. The required tools are very basic and not that different from those used for building kits with plastic. 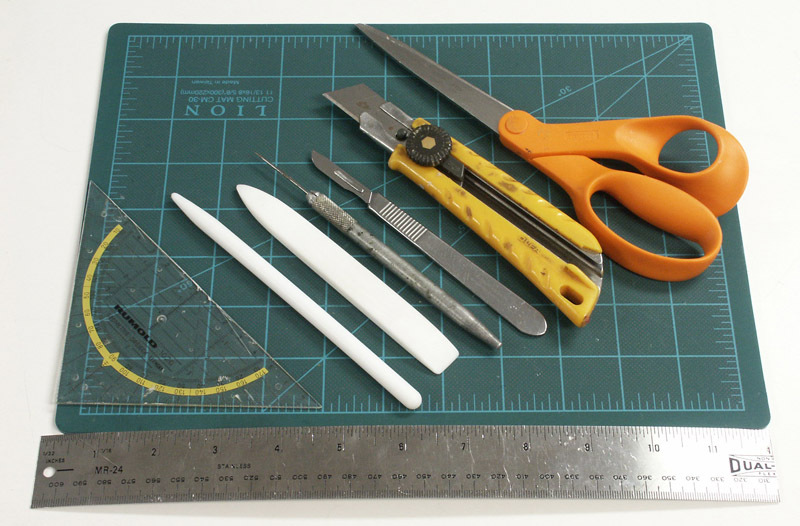 The most important of these are sharp scissors (small and larger), VERY sharp scalpels (surgical blades are best and as in Chicago politics, one changes blades early and often), a fine burnisher or bonefolder, a very fine needle awl, a dull needle for creasing, a variety of straight-edges, and a self-healing cutting mat. The latter is critical. While one can cut on scraps of cardboard, these very quickly get “chewed up” leading to ragged and torn cuts on the paper. In terms of the scalpel blades I prefer the #10 surgical blades that are curved as they have less of a tendency to tear the paper. Surgical blades are sharper than X-acto blades, and better in my experience for cutting paper. For adhesives I recommend “white” glues such as Elmers™ or Sobo ™ (both available in craft stores), or solvent based glues such as Dupont Duco™. Cyanoacrylites can also be used and are great for very small details. Experiment to see which works best for you. What is VERY important to keep in mind when working with card is that water (or any moisture) causes the paper to expand parallel to the grain causing waves and other distortions that can be difficult to repair. Paper-grain is a function of its manufacuture and all papers and cardboards have it. For an example of this, wet a piece of paper and card and watch what happens. While one won’t have a choice in materials when building kits, one does when scratchbuilding. To scratchbuild my models I like to use rag matboard, such as that used for framing pictures, because it is softer than chipboard and easier to work, never mind being gentler on scalpel blades. Depending on how one builds their models, folding and gluing vs. cutting and gluing, the foldability of the material will be critical. Not all card /folder weight papers fold cleanly so experiment.. Instructions for card kits are very basic, some might also say absolutely minimalist, with parts generally numbered in order of assembly. Cutting, folding, scoring/creasing instructions are provided in the form of a simple diagram and understood to be universal even though there are variations. After building a few basic kits, these instructions will make much more sense. See the list of tutorial links at the end of the article for some online tutorials in English and German. One of the most effective ways to add detail to card models is to recess details such as windows and doors, or to bring forward details like balconies or window boxes. While some kits will come with extra parts such as windows, color copiers and scanner/color printers can be a means of providing additional pieces. An example of adding detail would be to carefully cut out the window and adhere a piece of card with the desired amount of setback from behind to the area where the window was. Then, cut out the area of the window again and tone down the edges with acrylics, permanent markers, or colored pencils. Be careful with water-based colors and ink-jet printed paper. Even when fixed, the moisture needed for these to blend can cause the inkjet to bleed. Next mount the window previously cut out onto a larger piece of card leaving extra space along the edges. Adhere this to the model from behind so that the window is precisely positioned in the cutout. Using the same technique one can also bring forward details such as doors, ledges, trim, and window boxes. Once these techniques are understood and mastered it is logical to take the next step towards scratchbuilding, either from a photograph of an actual structure, or to free-lance your own using elements of from real structures. 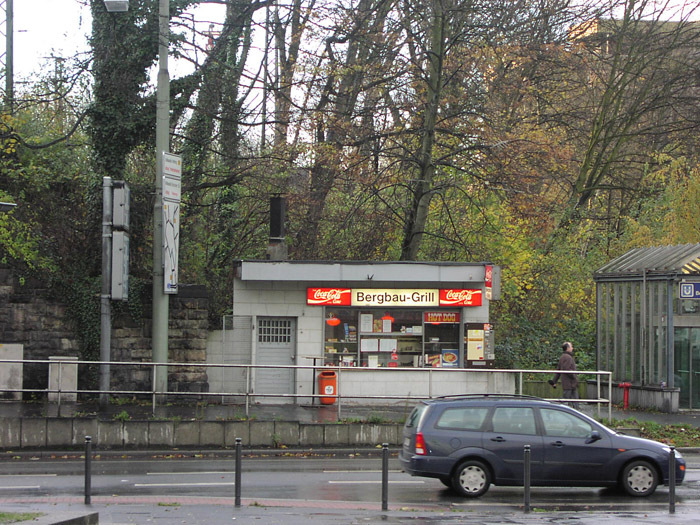 The Bergbau-Grill Bochum was created from a photograph of a typical Imbißbude (snack shack) found in the industrial regions of the Ruhr and elsewhere in Germany. Only the front was captured in the image that was taken with a very basic point and shoot digital camera. First, the resolution of the image was increased to 600dpi to make it easier to manipulate without losing details. Next, distracting elements such as the car, railing, and background were removed in Photoshop or similar editing software. Using this software, one can also correct perspective distortions. Next important details such as the waste bin, vending machine, and sign were copied, carefully cleaned up so that only the detail remains, and positioned adjacent to the structure in multiples. To determine proper scale a search for standardized door heights in Germany was done with one applied to the model. If the original intent had been to make a model of this structure, obviously measurements would have been taken on site. With the door height established, the image as a whole was scaled to 1:87. Once the height of an element such as the door is established, the model can be sized to any scale. After printing, the sheet with the image was backed with a repositionable (3M 568 Cold Mount) mounting adhesive. Door and display window were cut out before the facade was adhered to mat board. After rubbing down firmly, the mat board in the area of door and display window was cut out, the cut edges sanded smooth, and then toned down to match the color of the wall. The door and display window were then adhered to card and trimmed slightly larger before gluing into place. Raised elements such as vending machine, trash can and signage were cut out from the extras, mounted on mat board of varying thicknesses, trimmed out, toned and then glued into place on the model. Finally the side and back walls, and the roof were cut out of mat board and card, glued together, painted, and weathered. The image below shows the model in place on the layout. A downloadable version in scales H0, N, and Z is available on the Bergbau-Grill page. There you’ll also find other images of the model flanked by unmodified card models made by Stipp. After creating all the necessary sheets, multiples were printed out allowing for extras. All walls were cut to size from 4-ply matboard and taped together so that any sizing issues could be worked out. Next, the sheets of brickwork were applied using 3M’s mounting adhesive. All whole window units including trim were then adhered to thin card using the same adhesive, cut out along the outer edge, and adhered into position. Next I cut out the window to the inside of the trim also cutting through main wall. The edges of the board were then lightly sanded and toned to march the color of the trim. Next another sheet of windows mounted onto thin card and cut out leaving a border all around. These were then adhered to the facade from behind so that the windows were precisely positioned. The most tedious work now completed, the wall units were assembled to create the “wings” of the station. The center section of the station was assembled in a similar fashion, except that the window details were made of thin card for the trim and clear plexi laid behind to allow light to enter the hall. The inside was detailed with murals on both sidewalls and low-relief representations of ticket windows and kiosks. To go from street level to track level a ramp was built. The overhanging roofs were created of matboard and assembled separately. Laying down strips of black paper simulated the tarpaper on the roof. The roofs were then adhered to the walls of the station. To aid with placing figures and other details, the roof of the central section is removable. To complete the station, signage, posters, mailboxes, vending machines, and other details were created from images found online and in personal photos, mounted on board as necessary and adhered to the station before it was put in place on the layout. The canopies of the old Bonn station will remain for now, but will be replaced once suitable ones are designed. As I tell the story, the money to replace the canopies ran out as the station was being built during the Weltwirtschaftskrise (Depression). Then, after actually surviving the war fairly intact they were left in place, but are scheduled replaced in the course of future station renovations with something appropriate to the 70s. It was not until after I had finished the model that I discovered Scalescenes, a company in the UK, that’s makes some very nice downloadable (for a minimal fee) sheets of brick and stone work, concrete, and more, that are similar in coloring and the use of which would have saved me large amounts of effort. Nonetheless, the experience was invaluable for learning how to do this myself should parts not be available. More images of both these projects, and others, can be seen on the scratchbuilding page. Click here for a fuller, though by no means comprehensive list of links to other card modeling resources and vendors. Schreiber Bogen Tutorials/Bautipps: Includes videos. Alva Hansen. Card Modelling Basic and advanced Techniques. 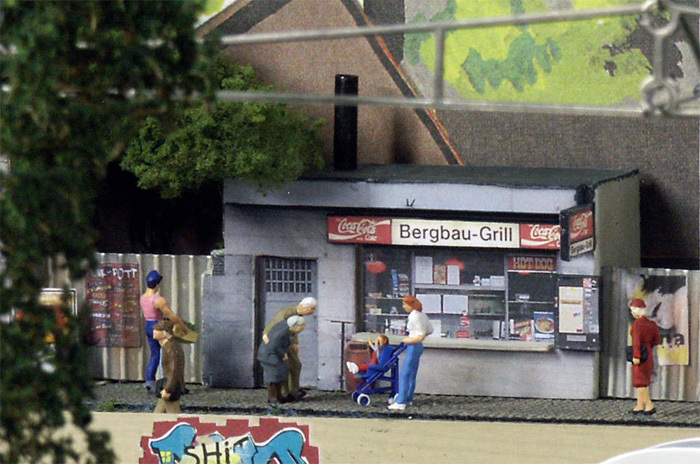 Eisenbahn Journal: Anlagen & Plannung,Gebäude-Modellbau, April 2005. MIBA: Issue 8/2000 has a special focus on working with card. Available by ordering from MIBA in print or on a DVD of all back issues up until 2005. Folders and burnishers from TALAS – Teflon or bone. Peter Verheyen was introduced to the hobby as a child, rediscovering it following the birth of Hope's and his daughter. Clinging to H0 (AC) analog operation his layouts have grown in size and complexity with lots of room for shunting. Interests include DB/DR era 3-4 (mostly) operation, scenery, card modeling, and scratch building. He can be reached at <verheyen@philobiblon.com>.